The ride started out well. I carried a crop, just in case I needed to reinforce the leg aid, but she was in front of my leg and even a bit spicy. No big deal. We did a lot of walk/halt/walk transitions before stepping into the trot. When we moved into the trot, she threw her right shoulder into my right leg to come off the connection and fling her head up in the transition. UGH. MMMmmmmk. Let’s break it down further. Walk on a small circle and bend her neck around the circle. NOPE. She flung her head up and threw her whole body to the outside, stumbling sideways and flinging her tongue out of her mouth. Alright, I am thinking… maybe this is physical. 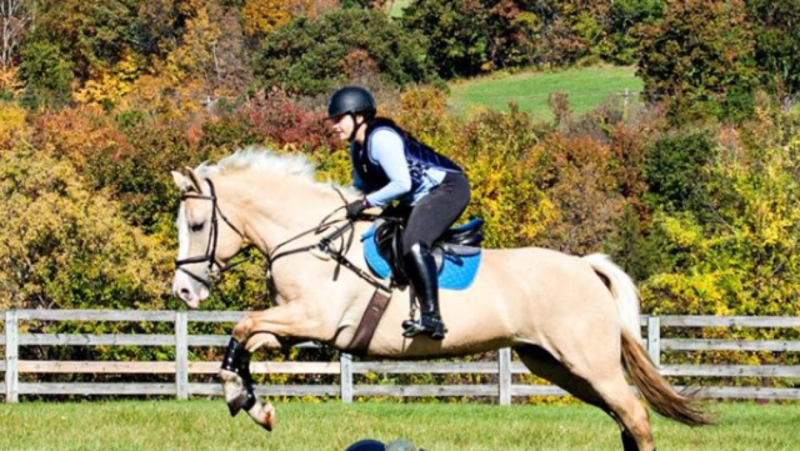 Maybe she is pretty sore and stiff from the jump lessons and bending her neck hurts. (Anyone else immediately fall down this rabbit hole?) Then, she saw a horse being ridden over across the field from the other barn. And She Lost Her Mind. Suddenly, she could bend all the way around to the right, while cantering, to try and see the horse behind her. Any kind of half halt was met with head flinging and tongue wagging. It was 45 minutes of me just trying to get SOME kind of response from her so that I could end on a good note. I ended up just riding her super straight and doing some collected/extended transitions in the trot (where to be honest, she had some moments of actual suspension). Unfortunately, I still got off feeling frustrated and annoyed. I gave May a proper cool down, put some thrush stuff in her feet (standing in the mud at the hay bale for hours on end is a great recipe for thrush), and used from probios cookies to do some stretches JUST IN CASE. However, it is one thing to have a really bad ride and have to go back to basics consistently with a horse that has talent. It is another to do it with a horse that is basically a BN horse AND has been a BN horse for 3 years. I know other people have worse rides. Rides that are genuinely dangerous. This ride wasn’t dangerous. It was just like… (trying to find a not super crude thing to write here)…. it was like writing a post where every time you finished a paragraph, it totally disappears on you. I think May got Sunday off, so today will be the follow up ride to Saturday. Then, my half leaser is out of town for the holidays, so I have her to myself for a while… and some extra time to actually ride. Maybe the weather will hold out, and we can go on a hack. BUT as Michele knows… it will probably rain. FYI – It will never not rain. Rain is our future, forever. I am so sick of rain. It’s not raining today by some miracle but rain is coming for me this weekend… Because I need more rain? Sorry you had that kind of ride. Been there, done that. So frustrating! ALMOST as frustrating as the rain hahaha. At least it makes me feel better about my decision to pull May’s shoes. There is no way she would still have them in this crap. Seriously, what is with all this rain?! I need my guys trimmed, they’re so overdue, but I think they’re doing better without the farrier since their feet are so soft. I’m worried everyone is going to be foot sore. HOPEFULLY in a couple weeks they will have a place to spend some time out of the mud… and I can get there feet take care off. I LITERALLY toweled off May’s feet (top and bottom) on Saturday so that they were somewhat dry enough to put some keratex/tomorrow on…. OMG! YES! I have frequently had that thought over the last two months (well really since it started raining last May AND NEVER STOPPED!). We only have an outdoor and it’s a grass ring. It’s nice. But when it’s rained for the last six months, it makes for terrible footing. I’ve been battling hoof problems, too. So my strategy for this winter is: ride when it’s nice, don’t beat myself up about not being able to ride or get out to the barn as much as I would like, and focus on coming out of the winter with healthy feet and be ready for some real training in April or as soon as the days get longer and the weather gets consistently better here in Central VA.
P.S. I use WordPress at work and switched back to the classic editor yesterday. I couldn’t edit any of our pages! It was terrible. Yeahhhh Saturday morning consisted of a trip to tractor supply to pick up Tomorrow because the purple stuff just wasn’t fighting off the thrush anymore. AND the season ended up being SO SHORT because of it. Here’s to a better 2019! hahaha so hummmmmbling. Progress isn’t linear. Right? And May. OMG i have had those rides with Remus (NOT THIS Past half year but hey I just dont ride now) where he is just a rebel including the I CANT MOVE OFF YOUR LEG and LOOK AT THAT HORSE CAN WE FOLLOW THEM? Sigh. hahaha I think that, from the comments on this post, people are way more fed up with mud than I am fed up with May. I have had very few BAD rides on my horse … ever…But my god, the last week has been terrible ! So behind my leg and just racing around like a doofus ! I read an article with Laura Graves yesterday about having them in front of your leg and it was a bit of an ah-ha moment in our ride last night We only walk/trotted for 20 minutes but it was great work finally ! I know exactly what you mean. This kind of ride is so frustrating. A week or two ago in my lesson, my trainer characterized it as Duke not receiving my inputs. It’s like he stuffs his hooves in his ears and just does what’s easy, no matter what aids or cues I use. SO. FRUSTRATING. Like to the point where we were cantering a circle and he was throwing his shoulders to the outside while still somehow refusing to bend his neck. Eventually it did get better (not before I half-shouted “Duke, RECEIVE MY INPUTS!” which weirdly helped…maybe it subconsciously made me be even firmer with my aids?). It will eventually get better with May, too. Stick with it. … knowing the attitude she’s been in, she would probably just roll in the sand/mud in the outdoor arena. I’m actually not hating the new WordPress editor. I find I end up with a lot less weird spaces between paragraphs and photos that I have to remove in HTML mode because they won’t disappear otherwise. Riding can be so frustrating sometimes, you think you’re getting somewhere and then you’ll have rides where your horse acts like a green broke half wild mustang. Oof. Hang in there! hahaha you’re probably right! If it’s hard, it’s probably working. Oh man. I remember a ride last spring right before I retired Gem where I fought for 45 minutes just to get her to halt without it taking 15 strides between the aid and her response. It was so frustrating! The mare knew how to halt. She just had no interest in listening to me. Then she got retired. HA! Hang in there. I think we need these rides to keep us humble and aware that in reality our partners perform because they choose to not being we are forcing them. Last night was definitely better (despite me putting my drop noseband AROUND the bit rather than under it….) Oh mares. Sometimes they just want to have fun. Rides like that can be super frustrating and sometimes its best just to hang up your spurs and try again the next day.